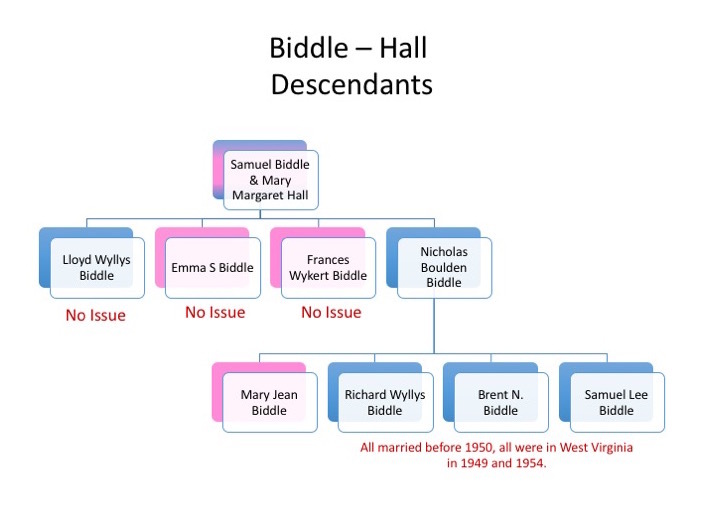 I needed to follow the descendants of Samuel and Mary Margaret (Hall) Biddle and see where any male descendants were likely to have been in 1953 when my half-sister Glennis was conceived. I kept looking, and looking, and looking for more children and grandchildren for Samuel and Mary, but just couldn’t find any. If I had looked at the family trees of other people and believed them when they showed only one child and four grandchildren, I would have saved a lot of time and effort. Samuel and Mary had four children, however, three of them had no issue. Only their youngest child, Nicholas Boulden Biddle, had children – four of them. Nicholas’ daughter, Mary Jean, was too young to have had male children old enough to be the biological father of Glennis. That left Nicholas’ three boys, Richard Wyllys, Brent N, and Samuel Lee to have the potential to be Glennis’ biological father. First, if any of the three were the biological father, then the relationship would be first cousins rather than second cousins. The DNA cMs indicated 2nd cousins, not 1st so, this is a very unlikely connection. Second, all three of them married before 1950. Third, all three of them were in West Virginia in 1949. Finally, all three appear to have stayed in West Virginia into the 1950s and none of them show any indications of having left West Virginia in 1953. Consequently, I don’t believe any of them is a candidate to be Glennis’ biological father. [i] My half-sister Glennis has long wondered who her biological father is. Ancestry DNA provided a clue; she shares 201 centimorgans of DNA across 8 segments with someone. The shared CM suggests they are second cousins, meaning that she and the other person likely share a great grandparent. The logic is that if I can take all eight of his great-grandparents and follow their descendants, possibly one of them was in the right place at the right time to be Glennis’ father. If so, I will have a very likely candidate to my Glennis’ biological father.